The Hollow Bettle by Susannah Appelbaum, a Mysterious Review. 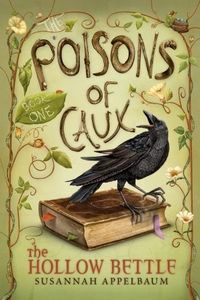 Review: "A very long time ago, a girl was poisoned … [and her father] the king turned his back on Caux and doomed his people to a life of misery under the Deadly Nightshades." So begins Susannah Appelbaum's first book in The Poisons of Caux series, The Hollow Bettle. Poisons have become a way of life in the kingdom of Caux, and without a proper taster, people are dying left and right. However, eleven-year-old Ivy Manx is worried about a lot more than simply being poisoned. Cecil, her uncle who has loved and cared for her since her birth, has disappeared. Cecil is not just an ordinary may–he is the last apotheopath healer in the entire kingdom–an outlawed profession by the evil King Nightshade. Ivy makes it her quest to return her uncle to the safety of their home. Little does she know there is a greater quest out there for her, and there are evil people that are looking to destroy her chances of success–and possibly even destroy her in the process. With the help of her newfound friend, Rowan–a failure of a taster–Ivy begins the adventure of a lifetime. "‘What kind of thoughtless buffoon do I have in my service? Are you even qualified to dispense this advice? Perhaps you have a diploma, then? From the school of Quackery? Who even authorized you to speak, you vulgarian?!' The king looked around the room, fuming. He paused theatrically. He felt a poem coming on–and instinctively, everyone in the room cringed." "Even if Verjouce weren't such a frightening apparition, his glowering countenance and vicious tongue were enough to give children nightmares. He stood head and shoulders above his cowering subrectors, with a mane of long hair parted severely down the center of his scalp–its shade one that was hard to pinpoint, almost devoid of color, as if the pigment were somehow leached out of it." This excerpt demonstrates a fairly typical vocabulary, though there are several more complex words–most of which seem to be associated with apotheopathy, which itself appears to be a profession fabricated specifically for this series. Unlike the Lemony Snicket series to which The Poisons of Caux has been compared, the author does not consistently offer definitions of complex words, and does not always supply enough context clues to help the early-middle school reader decipher unfamiliar words. For this reason, The Hollow Bettle is probably best suited for gifted readers, for whom the vocabulary may quite possibly still pose a challenge. Nonetheless, Appelbaum has done a commendable job with her first book in the series, and assuredly many children will look forward to her second installment. Special thanks to Alex Nauert for contributing his review of The Hollow Bettle. Acknowledgment: Random House provided a copy of The Hollow Bettle for this review.